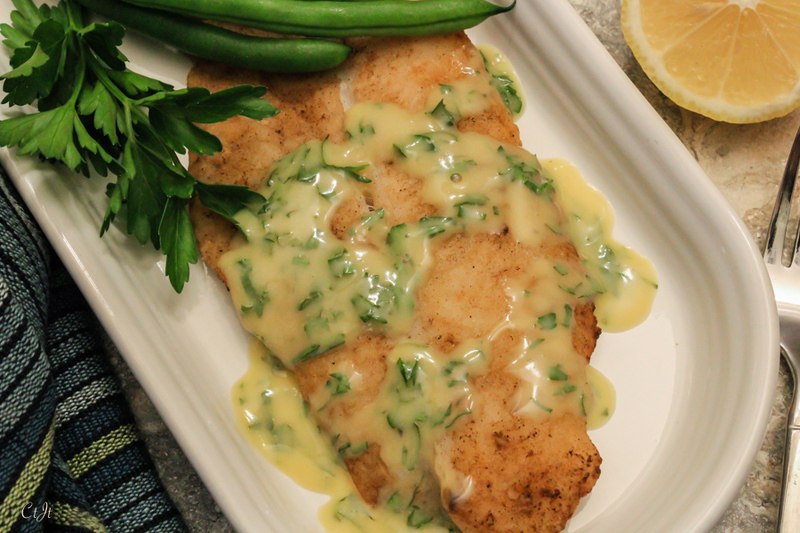 This lemon, wine & butter sauce is similar to a beurre blanc sauce, but doesn’t require as much butter. It’s light and pleasantly acidic, with a velvety smooth texture. It’s fantastic on fish and is also tasty with steamed vegetables. Serves 2. For the Fish: Heat oil in a cast iron or non-stick skillet over medium-high heat. Season both sides of the fish with salt. Mix together the flour, salt and pepper; spread it out on a plate or board and then dip both sides of the fish in the mixture, shaking off excess. Add fish to the skillet and cook for about 2 minutes per side, turning once, or until lightly and nicely browned. Cook longer if necessary, depending on thickness of fillets. Remove fish from heat and set aside, keeping warm. For the sauce: In a small skillet, heat the wine and lemon juice over medium-high heat and bring to a boil. Lower heat to low/medium-low and simmer to reduce to about 2 tablespoons total. This should take about 7 to 10 minutes. Remove skillet from heat and add in two cubes of cold butter, whisking constantly as it melts softens and breaks down — you don’t want the butter to melt completely to a liquid, just to become emulsified (thick and creamy) with the other ingredients. Add another cube of butter just before the first have completely melted. Place the skillet back on the heat over low, as low as it can go. While whisking, repeat the addition of butter process a cube at a time using 2 tablespoons total of butter. If the butter seems to be melting too fast, turn off the heat for a little while. Add the parsley, season sauce and taste, making adjustments as desired: If it is too acidic, add another cube or two of butter, up to 1 tablespoon more, and season with salt and white pepper to taste. Spoon or pour sauce over the cooked fish filet and serve immediately. Put a little cold water, maybe 2 teaspoons, in a bowl. While whisking, slowly add the sauce to the bowl and watch it transform back into a smooth consistency. Return to low heat again if needed. In the kitchen with Sigona's: Guac-plus!